Photo Courtesy of the United States Department of Agriculture. Photo by Garry D. McMichael. In the U.S., rice is grown in huge fields called checks that can be flooded. In between rice crops, a crop called vetch is planted in the check. 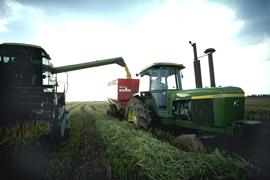 To prepare a rice check, a tractor pulls a special plow called a moldboard plow that turns under the vetch, which acts as compost and as a fertilizer. Then tractors level the rice check. Rice grows best in clay soil, which softens underwater but does not let water drain through once it is saturated. The rice is kept flooded in 6-8 inches of water until just before harvest. The growing rice is treated periodically with pesticides and herbicides to kill insects and weeds. A harvester, or combine, cuts the rice and then separates the kernels from the stems and the husks from the kernels. The rice is then dried and stored in preparation for milling, when computerized machines remove the brown hulls from the rice. For pictures and a detailed description, click on the DOCUMENTS link below.